The Vietnam War lasted from 1955 to 1975 and occurred in Vietnam, Laos and Cambodia. The United States supported South Vietnam against North Vietnam and the Viet Cong, who were supported by a number of communist countries. After two decades of fighting, the North Vietnamese won the war, and North and South Vietnam were reunited with North Vietnam to create a the Socialist Republic of Vietnam. Journalism shifted significantly during the Vietnam War. Journalists had previously covered wars by using press conferences and briefings by the United States government; this time, they sent journalists to cover the war on the ground and use their own research and reporting. 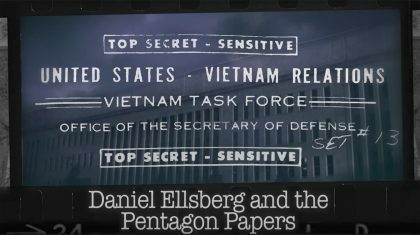 During the war, a whistleblower named Daniel Ellsberg leaked the Pentagon Papers to Washington Post reporter Ben Bagdikian. Those documents uncovered government lies and started to shift the public’s perception of the war after Bagdikian gave them to a senator to be read into the public record. Once the media started showing how badly the war was going, many Americans stopped supporting the war. Ben Bagdikian remembers how he obtained a copy of the Pentagon Papers, a secret Defense Department history of U.S. involvement in Vietnam, leaked by Daniel Ellsberg. Click on individual events to expand items one by one, or click the expand all button to view the entire contents of the timeline. The eight-year French-Indochinese War concludes with an overwhelming French defeat at the battle of Dien Bien Phu. The ensuing peace conference in Geneva divides Vietnam (formerly Indochina) into a communist-controlled North and an allegedly democratic South. At his inauguration, President John F. Kennedy promises aggressive support for America’s friends and vehement resistance to its foes.1 Stressing the need for containment of communism in Southeast Asia and citing the domino theory that if one nation falls to communism, neighboring states will follow, Kennedy and his successor, Lyndon B. Johnson, slowly escalate U.S. military presence in Vietnam. President Johnson addresses the nation, declaring that while on “routine patrol” in the Gulf of Tonkin, U.S. warships had been deliberately attacked by North Vietnamese torpedo boats. It emerges years later that this attack never actually happened. Congress passes the Gulf of Tonkin Resolution authorizing the use of conventional military force in Southeast Asia. Operation Rolling Thunder begins. It is one of the most intense, yet least successful, aerial bombardment campaigns in military history. The operation intends to discourage the North Vietnamese Army (NVA) from any incursion in South Vietnam while simultaneously avoiding the engagement of U.S. ground troops. Operation Rolling Thunder ends four years later after dropping 864,000 tons6 of American bombs on North Vietnam. North Vietnamese and Viet Cong forces launch the Tet Offensive, a massive attack that reaches far into South Vietnam. While the U.S. and South Vietnamese militaries are initially surprised at such a coordinated assault, they secure a tactical victory. Most Americans at home, however, are shocked that a supposedly weakened enemy could conduct such a synchronized attack. The initial effectiveness of the Tet Offensive combined with increasingly critical news coverage contribute heavily to President Johnson’s decision not to seek reelection. President Nixon finally announces the decision to attack NVA positions in Cambodia. He promises the campaign in Cambodia will be over by June 30. John Kerry, representing Vietnam Veterans Against the War and testifying before the Senate Foreign Relations Committee, calls for the immediate and unilateral withdrawal of U.S. troops from Vietnam.27 These hearings, chaired by Sen. Fulbright, are instrumental in altering American opinion of the conflict. Daniel Ellsberg, a former Pentagon aide and a RAND Corporation analyst, leaks a top-secret Department of Defense report on the history of U.S. political and military involvement in Vietnam from 1945 to 1967 to Neil Sheehan of The New York Times. The newspaper publishes excerpts from the report, soon known as the Pentagon Papers. 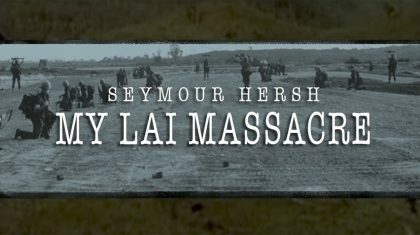 The first article begins, “A massive study of how the United States went to war in Indochina, conducted by the Pentagon three years ago, demonstrates that four administrations progressively developed a sense of commitment to a non-Communist Vietnam, a readiness to fight the North to protect the South, and an ultimate frustration with this effort — to a much greater extent than their public statements acknowledged at the time.”28 The report exposes the secret history of the conflict and widens the credibility gap between the Nixon administration and the American people. Incensed and embarrassed, the government attempts to prevent the publication of additional stories based on the Pentagon Papers by, for the first time in U.S. history, trying to use the court system to stop a newspaper from printing. The government succeeds in getting a temporary federal injunction against the Times. After 11 years and more than 58,00033 American lives lost (along with the lives of 63 journalists — a number surpassed only by the recent Iraq War34), the last U.S. helicopter leaves Saigon as North Vietnamese forces overrun the South Vietnamese capital. The NVA’s guerrilla tactics and incredible resolve, combined with U.S. domestic opposition, pivotal events such as the Kent State shootings, the Fulbright hearings and the publishing of the Pentagon Papers, bring an end to the American presence in Vietnam. Ahern, Thomas L., Jr. Vietnam Declassified: The CIA and Counterinsurgency. Lexington: University Press of Kentucky, 2010. Ellsberg, Daniel. Secrets: A Memoir of Vietnam and the Pentagon Papers. New York: Penguin Putnam, 2002. Emerson, Gloria. Winners & Losers: Battles, Retreats, Gains, Losses and Ruins From a Long War. New York: Random House, 1976. Fullbright, J. William. The Arrogance of Power. New York: Random House, 1967. Galloway, John. The Gulf of Tonkin Resolution. Rutherford, NJ: Fairleigh Dickinson University Press, 1970. Griffiths, Philip Jones. Agent Orange: “Collateral Damage” in Vietnam. London: Trolley Ltd., 2003. Halberstam, David. The Best and the Brightest. New York: Ballantine Books, 1969. Halberstam, David. The Making of a Quagmire: America and Vietnam During the Kennedy Era. New York: Roman & Littlefield Publishers, 2008. Hammond, William M. Reporting Vietnam. Lawrence: University Press of Kansas, 1998. Hendrickson, Paul. The Living and the Dead: Robert McNamara and Five Lives of a Lost War. New York: Alfred A. Knopf, 1996. 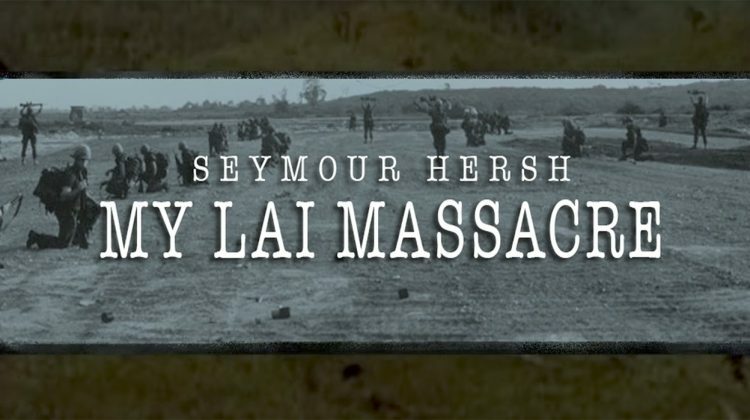 Hersh, Seymour M. My Lai 4: A Report on the Massacre and Its Aftermath. New York: Random House, 1970. Herr, Michael. Dispatches. New York: Avon Books,1968. Kaiser, David. American Tragedy: Kennedy, Johnson, and the Origins of the Vietnam War. Cambridge, MA: Harvard University Press, 2000. Karnow, Stanley. Vietnam: A History. New York: Viking Press, 1983. Langguth, A.J. Our Vietnam: The War 1954-1975. New York: Simon & Schuster, 2000. Laurence, John. The Cat From Hue: A Vietnam War Story. New York: PublicAffairs, 2002. Maclear, Michael. The Ten Thousand Day War: Vietnam 1945-1975. New York: St. Martin’s Press, 1981. MacPherson, Myra. Long Time Passing: Vietnam and the Haunted Generation. Garden City, NY: Doubleday, 1984. Maraniss, David. They Marched into Sunlight: War and Peace, Vietnam and America, October 1967. New York: Simon and Schuster, 2003. McMaster, H.R. Dereliction of Duty: Lyndon Johnson, Robert McNamara, the Joint Chiefs of Staff and the Lies That Led to Vietnam. New York: HarperCollins, 1997. McNamara, Robert S. In Retrospect: The Tragedy and Lessons of Vietnam. New York: Times Books, 1995. 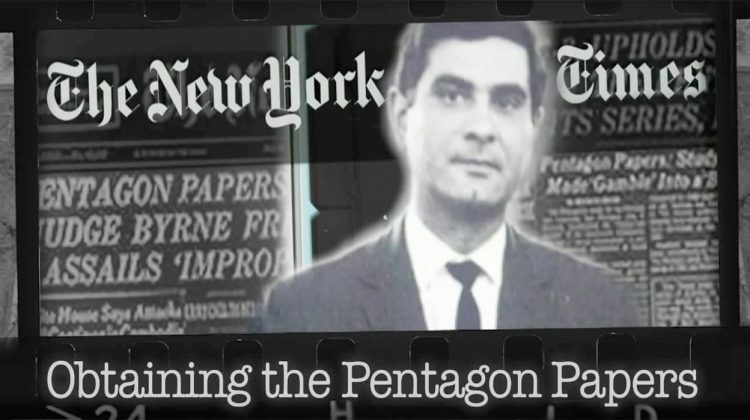 The Pentagon Papers: As Published by The New York Times. New York: Quadrangle Books, 1971. Prados, John and Margaret Pratt Porter, eds. Inside the Pentagon Papers. Lawrence: University Press of Kansas, 2004. Prochnau, William. Once Upon a Distant War: Young War Correspondents and the Early Vietnam Battles. New York: Random House, 1995. Reporting Vietnam: American Journalism 1959-1975. New York: Literary Classics of the United States, 1998. Schulzinger, Robert D. A Time for War: The United States and Vietnam, 1941-1975. New York: Oxford University Press, 1997. Shapley, Deborah. Promise and Power: The Life and Times of Robert McNamara. Boston: Little, Brown and Company, 1993. Shawcross, William. Sideshow: Kissinger, Nixon and the Destruction of Cambodia. New York: Simon & Schuster, 1987. Sheehan, Neil. The Arnheiter Affair. New York: Random House, 1971. Ungar, Sanford J. The Papers & The Papers: An Account of the Legal and Political Battle Over the Pentagon Papers. New York: Columbia University Press, 1989. Windchy, Eugene G. Tonkin Gulf. Garden City, NY: Doubleday, 1971. Wyatt, Clarence R. Paper Soldiers: The American Press and the Vietnam War. New York: W.W. Norton, 1993. 1 Langguth, A.J. Our Vietnam: The War 1954-1975. New York: Simon & Schuster, 2000: 112. 2 “Stern Crisis” editorial. Washington Post 6 Aug. 1964. 3 The Best of I.F. Stone. New York: PublicAffairs: 247-255. 4 Stone, I.F. “What Few Knew About the Tonkin Bay Incidents.” I.F. Stone’s Weekly (Special Issue on Indochinese War) 24 Aug. 1964. 5 Cummins, Joseph. Why Some Wars Never End: The Stories of the Longest Conflicts in History. Beverly, MA: Winds Press, 2010: 184. 6 Kane, Tim, and David D. Gentilli. “Is Iraq Another Vietnam? Not for U.S. Troop Levels.” The Heritage Foundation, September 2004. 7 Johnson, Lyndon Baines. “State of the Union Address.” 12 Jan. 1966. 8 Peters, Charles. Lyndon B. Johnson. New York: Times Books, 2010. 9 “Vast U.S. Aid Loss in Vietnam Denied,” New York Times 18 Nov. 1966. 10 Fulbright, J. William. The Arrogance of Power. New York: Random House, 1967. 11 McNamara, Robert S. et al. Argument Without End: In Search of Answers to the Vietnam Tragedy. New York: PublicAffairs, 1999: 252. 12 “Senate Foreign Relations Committee Releases Volumes of Previously Classified Transcripts from Vietnam Era Hearings.” Press release, Senate Committee on Foreign Relations 14 Jul 2010. 13 Martin, Douglas. “Walter Cronkite, 92, Dies; Trusted Voice of TV News.” New York Times 17 July 2009. 14 “For Vietnam Peace.” Editorial. New York Times 11 Aug. 1968. 15 Shawcross, William. Sideshow: Kissinger, Nixon and the Destruction of Cambodia. New York: Simon & Schuster, 1987: 19-22. 16 Beecher, William. “Cambodia Raids Go Unprotested,” New York Times 9 May 1969. 17 Wyatt, Clarence R. Paper Soldiers: The American Press and the Vietnam War. New York: W.W. Norton, 1993: 208. 18 “Aides Confirm Nixon Okayed Pentagon Taps.” Pittsburgh Post-Gazette 16 May 1973. 19 Morton Halperin et al., v. Henry Kissinger et al. 606 F.2d 1192. D.C. Circuit Court. 1979. 20 “On This Day, 1969: Millions March in Vietnam Moratorium." BBC 15 Oct. 1969. 21 Hersh, Seymour M. “Hamlet Attack Called ‘Point-Blank Murder.’” St. Louis Post-Dispatch 20 Nov. 1969. 23 Kifner, John. “4 Kent State Students Killed by Troops.” New York Times 5 May 1970. 24 Lewis, Jerry M., and Thomas R. Hensley. “The May 4 Shootings at Kent State University: The Search for Historical Accuracy.” Ohio Council for the Social Studies Review 34(1) 1998: 9-21. 25 “Complete testimony of Lt. John Kerry to Senate Foreign Relations Committee.” Congressional Record 22 Apr. 1971. 26 Sheehan, Neil. “Vietnam Archive: Pentagon Study Traces 3 Decades of Growing U.S. Involvement.” New York Times 13 June 1971. 27 Sachs, Stephen E. “‘All the News That’s Fit to Print’: The New York Times and the Pentagon Papers”1996. 28 Finan, Christopher M. From the Palmer Raids to the Patriot Act: A History of the Fight for Free Speech in America. Boston: Beacon Press, 2007: 231. 29 Stone, Geoffrey R., Perilous Times: Free Speech in Wartime: From the Sedition Act of 1798 to the War on Terrorism. New York: W.W. Norton, 2004. 31 Vietnam Veterans Memorial Fund. 32 Santora, Mark, and Bill Carter. “For Journalists, Iraq Becomes Deadliest War.” New York Times 30 May 2006.